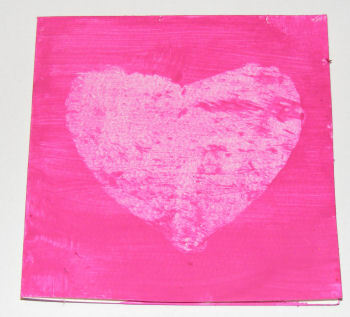 Cut out a tissue paper heart (you might want to use our heart templates). Paint the front of your card in slightly watered down poster paint. While the paint is wet stick on your tissue paper heart. Leave for two minutes and then take off the tissue paper. The more of a contrast in colour between your paint and tissue paper the better the result.